TapGem is a very interesting puzzle app game. 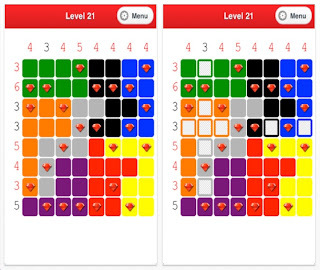 The object is to place 4 gems on each colored region and ensure that each row and column has the correct number of gems as indicated. See the left margin and the row of numbers on the top. If a number is in black, then you have satisfied the correct number of gems in that row or column. 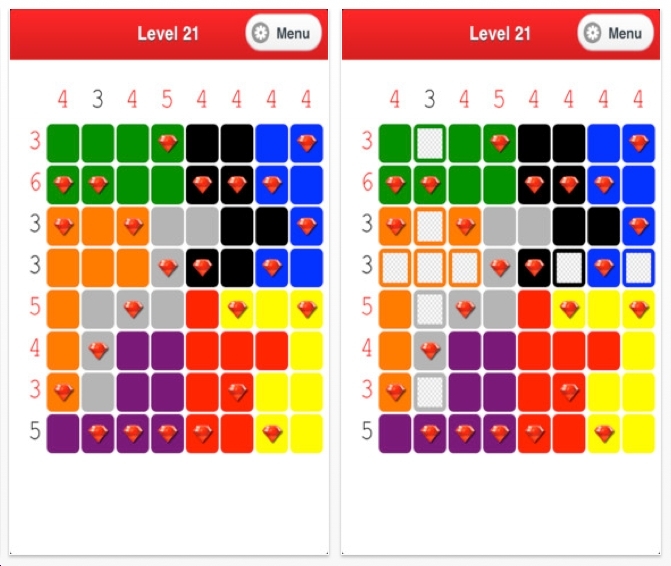 You can then white out the other squares because they cannot have gems. There are 60 free levels. I've done all the easy and medium levels. Here's what I don't like: many of these puzzles have multiple solutions: 2, 4 or even more solutions! Major ugh. When you open a level: some gems are already given to you. This concept was done not too long ago in another app called 63 Logic Games. Which I don't see on the iTunes store anymore. I recommend Twin Beams. Much better puzzle app for a variety of reasons. 1. No clues are given. 2. The rules make the puzzles more challenging. 3. ONLY 1 SOLUTION PER PUZZLE. 4. Graphics are much better. 5. Statistics indicate how fast you can solve the puzzles. 6. You get a lot more puzzles for your money. 7. Twin Beams has a button to undo multiple moves. 8. When a row or column or area is complete, it does the mop-up work for you so you can solve them faster. Back to TapGem: I've been doing the hard levels. What I really like is that the colored areas are split. For example the orange squares are not necessarily connected to each other. I have done 5 of the 20 hard levels. They're good. But still, some of them have multiple solutions. Here's another way to explain my frustration: have you ever solved a logic problem with clues and a grid? They go something like this: 5 people live in 5 different houses in a row, and have different dogs. Mr. Jones does not live on either end but he does own the Dalmatian. For those kinds of logic problems, there is only 1 correct answer - always. It would be maddening otherwise. So that's how I feel about TapGem. But I still like it.